At DROOL, we’ve recently started using URL “links” to our game objects that we can easily share via e-mail. It’s simple and probably not a unique solution. But it’s been useful and feels like a feature every engine should have. It was quick and easy to implement, but the most time was spent working around some minor annoyances. SUP FLURY. There is a rendering problem with bug_eyed.mesh in gameplay/resource/bugs.objlib. I’m not sure if there’s a problem with material settings or a code issue? Writing e-mails like this isn’t hard, but we send hundreds of e-mails to each other every month. Even in this simple example, there’s opportunity for the sender to mistype file and object names. 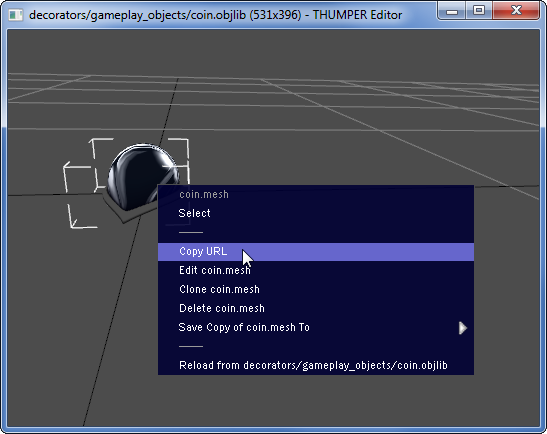 And the receiver has to navigate to the appropriate file, search the file for the object, and open the object editor. Wouldn’t it be nice to avoid this error-prone and manual labor? SUP FLURY. There is a rendering problem with http://drool.ws/gameplay/resource/bugs.objlib?obj=bug_eyed.mesh. I’m not sure if there’s a problem with material settings or a code issue? When I click that link, the DROOL editor is launched, the “bugs.objlib” file is opened, and the editor for the “bug_eyed.mesh” object is opened automatically. Replace C:\path\to\your\editor.exe with the path to your editor’s executable (don’t forget to double backslashes). Run the file via the command line or by double-clicking in Explorer. You’ll have to click through some security warnings. Since we’re a two person team, my “deployment” method was to simply check this .reg file into source control and tell Brian to run it on his machine. Large teams probably already have a way to deploy scripts like this to every team member’s machine. Large teams might also have multiple editors installed on each machine (for different source branches or projects). For brevity, I’m skipping over these issues here. Now that your URL protocol is registered, you can test it by typing a link starting with your protocol (e.g. drl://test) into your web browser. You might have to click through another security warning, but your executable should be launched and the full URL will be passed to it as a command line argument. Now your next coding task is to parse the URL into a file name and object, open that file, and open the object editor automatically. I’ll leave the details to you, but if you already support double-clicking your editor files in Windows Explorer, then you’ve already done 90% of the work. At this point, I thought I was finished with URL protocols, but I discovered that unlike standard http:// protocol URLs, if you paste a URL with a custom protocol (like drl://) into most e-mail clients (like Gmail), they don’t automatically get turned into “click-able” links when you send the e-mail. Of course, you can manually make links with custom URLs into click-able links by using your e-mail app’s GUI, but that is not quick and easy enough for me. I just want to paste the link and send it! After some research, I learned that custom protocol URLs aren’t automatically click-able in most e-mail clients for mod_rewrite and a regular expression rule. I recommend that you don’t do any actual parsing of your URL in your webserver, just do a simple find/replace and then redirect. I prefer to keep all the parsing in my editor and involve the webserver as little as possible. UPDATE: As commenter F Fulin suggested below, an alternative to redirecting is to use a standard, but out-dated, protocol (e.g. gopher://) instead of a custom one. If your e-mail client automatically highlights links using a protocol (and you don’t need to use it for anything else) you can hijack it and avoid redirecting. Once you have this much working, everything else is gravy. Now that we can go from an Object URL to a specific file/object in our editor, the obvious next step is to make it easy to extract Object URLs from our editor. When you right-click objects in our editor, the context menu has a “Copy URL” option. Selecting that copies the Object URL for a particular object to the clipboard. It’s typical for a large team to have a server that continuously grinds through game files and objects, potentially producing errors for each object based on certain validation criteria. On a large project, you might have thousands of object-related errors at any one time. From my experience, it’s challenging to manage this process. Artists and other content creators might not appreciate the importance of these errors and it’s hard to keep the overall error count under control. If you include Object URLs with these errors, I suspect that everyone on the team will appreciate the added convenience and will be more likely to fix their errors promptly. This was also posted to the DROOL Development Blog.